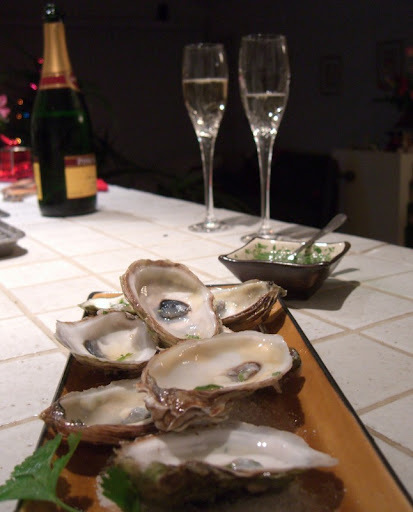 We've always had a tradition of seafood on Christmas Eve. It started with Sherry's family tradition of oyster stew. That evolved into more of a chowder which then became a multi-fish stew. Last year, when we learned of the Italian tradition of La Vigilia (the Feast of the Seven Fishes), we decided that it was right up our alley. 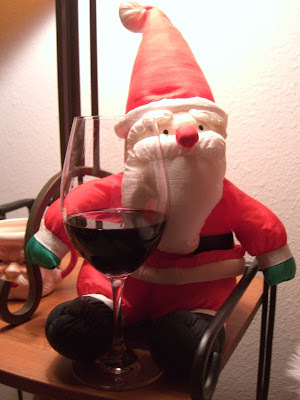 We are continuing the tradition this year, but it certainly isn't traditional Italian. No pasta (it takes up too much belly-room better saved for more fish) or Baccalà (for a poor-man's staple food, it is ridiculously expensive) . We started with oysters on the half-shell, topped with a Thai mignonette. 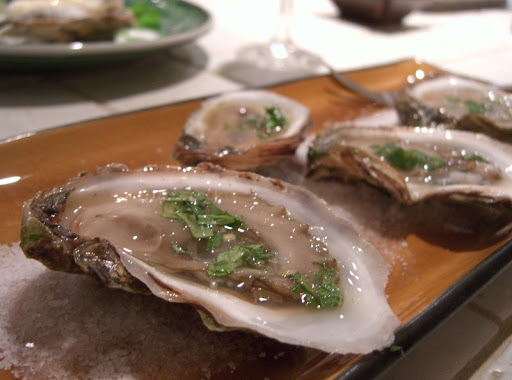 The mignonette had a fish sauce and lime juice base, with chopped basil, cilantro, mint and ginger. Fish with Spicy Lentils is a dish we make often and each time we've had it, we've thought about making some sort of croquette with the leftovers. This was the perfect occasion. 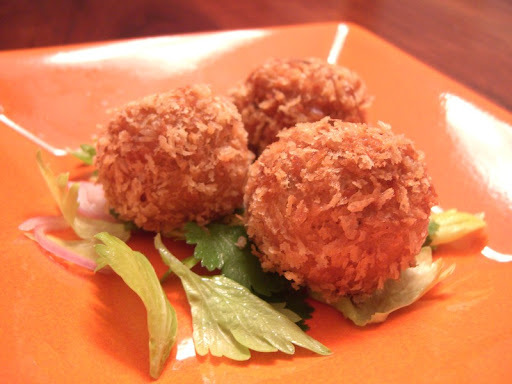 Rolled into little balls, crusted with panko and shallow-fried, we had them on a bed of celery greens. 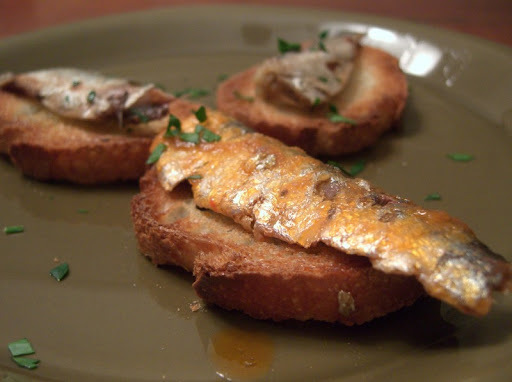 Up next was sardine crostini with two kinds of sardines. The smaller ones are your basic store variety (product of Scotland) and the larger ones were Spanish and packed in a tomato base. 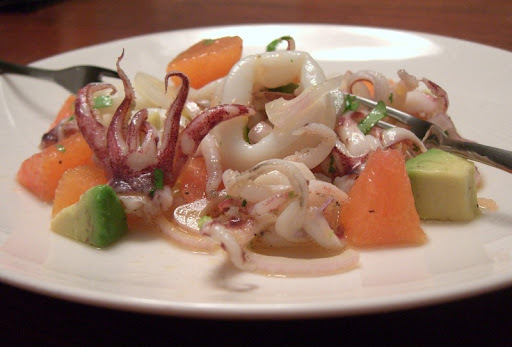 As a refresher before the final coarse, we had a "Yucatecan" squid salad. The squid was lightly blanched and then marinated in mixed citrus juice (orange, lime and lemon). It was garnished with Cara Cara orange and avocado. 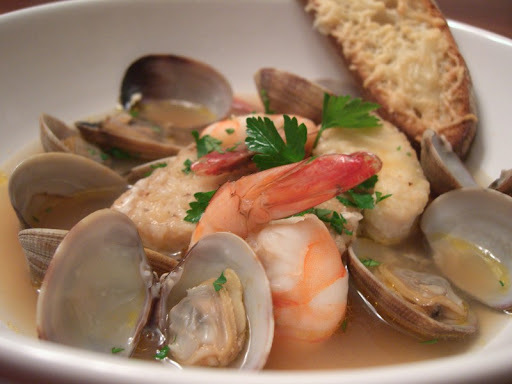 And finally, we had a fish and shellfish stew. This year we used halibut, swordfish, Manila clams and Mexican white shrimp. Update: Check out our review of the Feast of the Seven Fishes comic strip book. Starting last Saturday, Brandt Beef has begun selling at the farmers' market here in Pacific Beach. 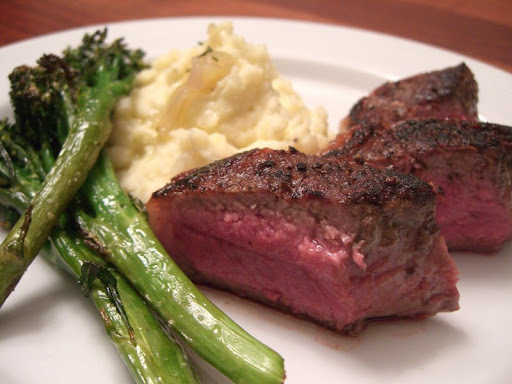 We picked up a nice New York Strip which cooked up great - a good sear to give a crust on the outside, and a perfect ruby rare center. With some shallot mashed potatoes and some oven roasted broccoli, it made a fine dinner indeed. 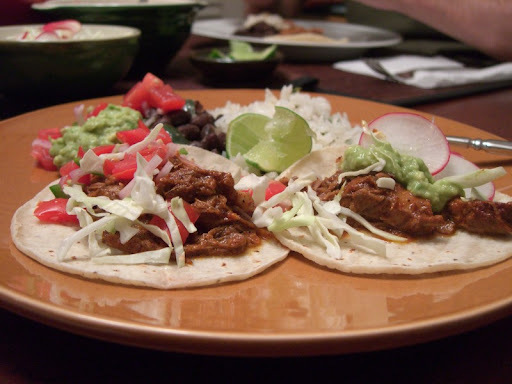 Leftover Cochinita Pibil makes fantastic tacos. 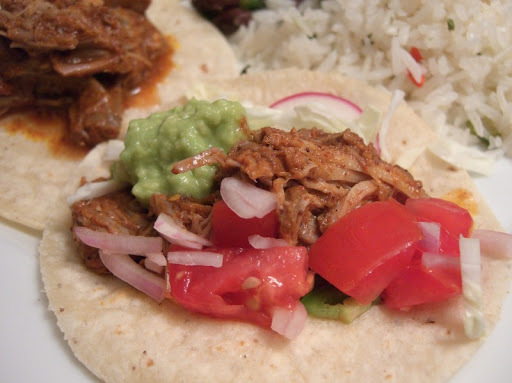 The shredded cabbage adds nice texture and some soft, rich guacamole counters the sharp taste of the Pibil. 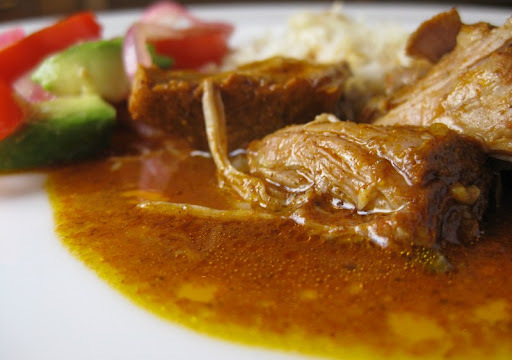 At the heart of Pibil is the sauce that the pork marinates and then cooks in. It is a blend of achiote paste seasoned with cumin, mexican oregano, black pepper, allspice, cinnamon, clove and garlic, plus citrus juices and habanero. Traditionally the citrus juice is from the sour orange, but we use a blend of sweet orange, lime and lemon juice instead. 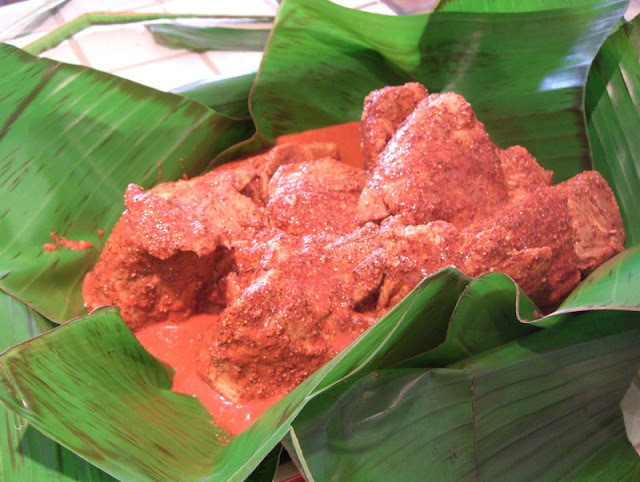 The achiote is a small tree that grows in Mexico and other parts of Central and South America. 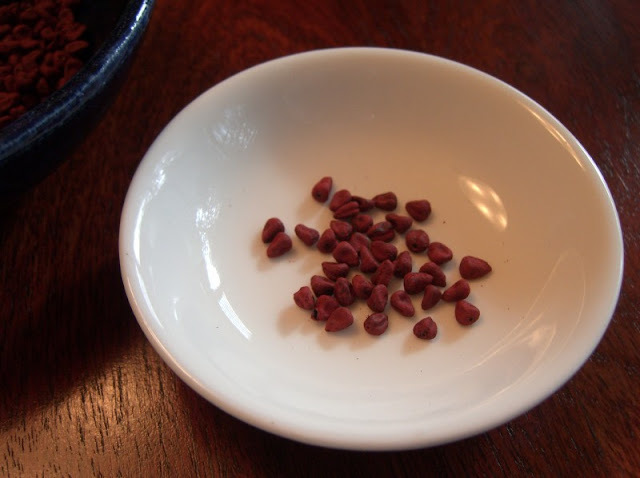 It produces annatto seeds, which you can see here. You can buy pre-made achiote paste, but it is pretty easy to make yourself by grinding up annatto seeds. They are extremely hard, though, so you'll want to use a coffee grinder. We tried using a mortar and pestle (*way* too much work) and a ceramic spice grinder (it couldn't get good enough purchase on the seeds). Trust me -- just use a coffee grinder. Once the annatto seeds and hard spices have been ground to a very fine powder, they are blended up with the juices, garlic, salt and a seeded habanero to create a deep, brick-red colored marinade. 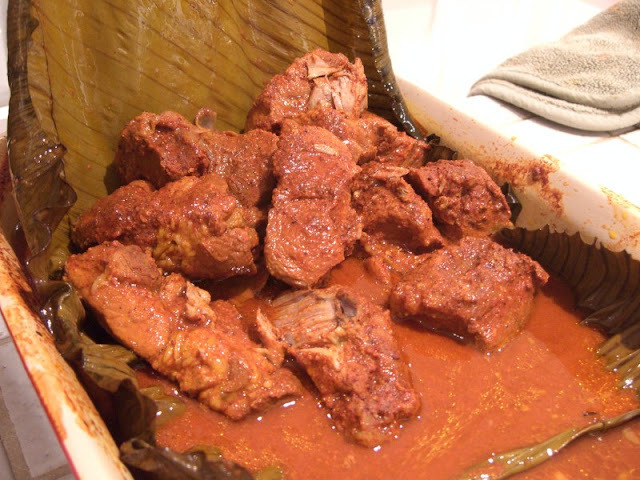 The other key technique in a pibil is that it cooks slow and low, wrapped up in banana leaves. Before wrapping, make sure to soften the leaves over a hot burner on your stove. You will clearly see the leaves change with the heat -- taking on a sheen as the oils are released. 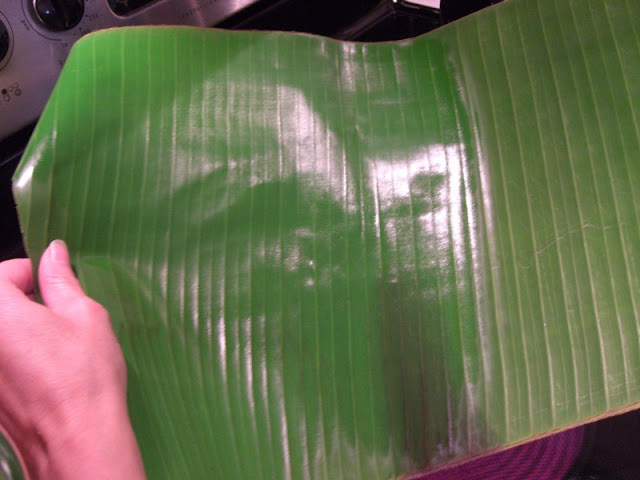 Then line a casserole pan with the banana leaves and plop in your marinated pork pieces. Encase the meat completely within the leaves to create a tight package, then cover with foil to ensure a moist steaming environment. After roasting at 325' for about 4 hours, this is what you get when you unwrap. Lovely soft pork pieces. Rich, complex and highly aromatic. Tangy from the citrus, earthy and fragrant from the achiote and just a hint of heat from the habanero. 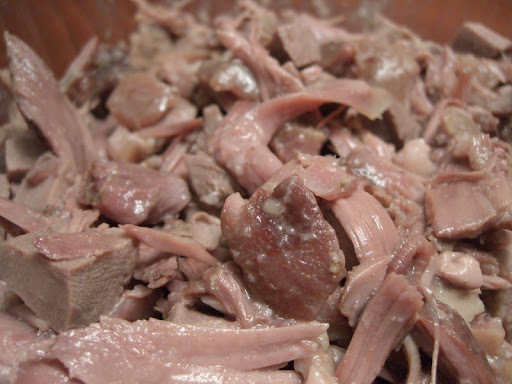 The leftovers can be used to make fantasic pibil tacos. Adapted from Robert Rodrigez' "10 minute cooking school" and Rick Bayless's Mexico, One Plate at a Time . 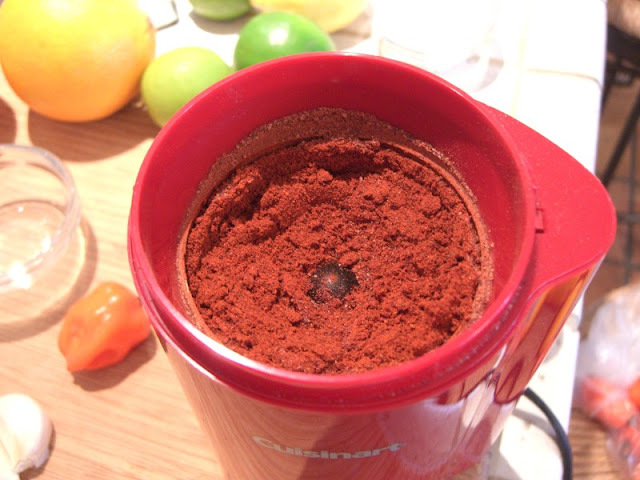 A small coffee grinder dedicated to spices is the best method for creating the achiote powder. Grind the annatto seeds to a fine powder using an electric spice grinder. 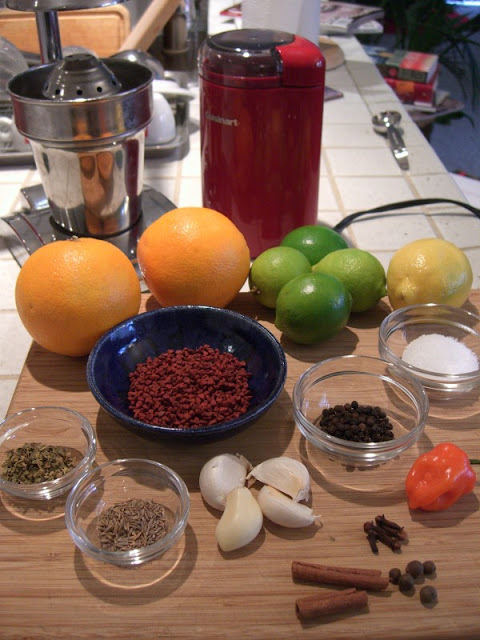 Repeat with the cumin seeds, oregano, peppercorns, allspice, cinnamon and cloves. 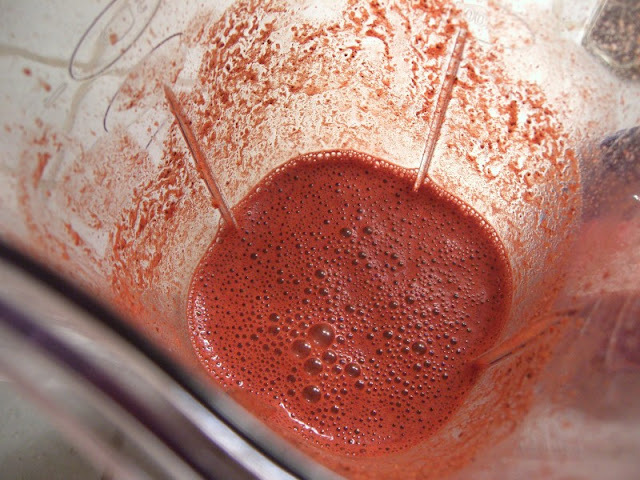 Place the liquids, salt, garlic, habanero and powdered spices into a blender and blend well. 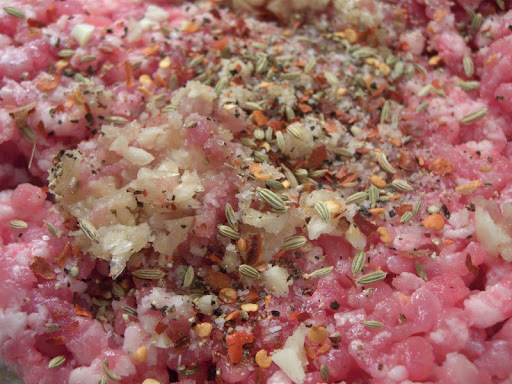 Combine the marinade with pork chunks in a large ziplock bag. Refrigerate at least two hours or overnight. 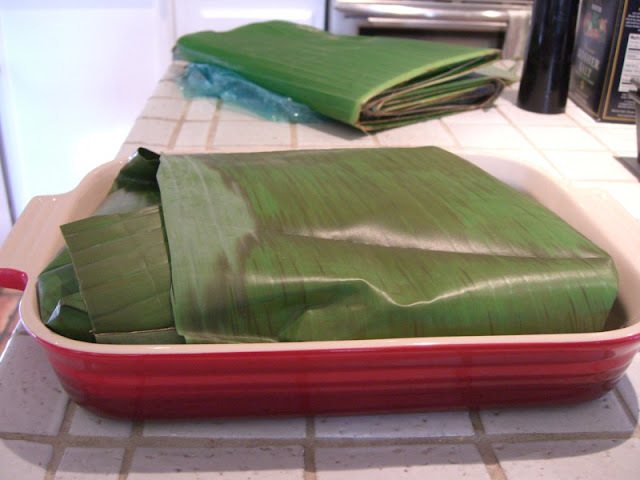 Line a baking dish with banana leaves that have been softened over a flame or hot burner. Pour the pork and marinade into the dish and wrap with the leaves. Cover the pan with foil and roast in a preheated, 325 degree oven for 4 hours. Remove from oven and let rest 20 minutes. Serve with plain rice and a simple green salad. Why am I pissed at a small wine-making town in Luxembourg? Because that is where the Schengen Agreement was signed. For a while now, we have been planning extended (i.e. a year or so) travel in Europe, and this particular agreement is throwing a big wrench into our plans. The agreement allows open borders between most of the European Union and essentially makes them seem like one big country to foreign travelers. That doesn't seem bad, until you look into visa issues. The problem is that now that the EU countries are all nice and friendly with each other, they limit your travel visa time in the region as a whole. You can only spend 3 months in Schengen countries before you need to leave. And you need to leave for at least another 3 months before you can come back. This, of course, makes it very difficult to do extended travel in Europe. There are special visas that you can get, but the process seems very difficult, potentially expensive, and not guaranteed to end successfully. So, screw Schengen (at least for now). We're off to D.F. A by-product of our recent testa making experience was nine cups of left-over gelatinous liquid. 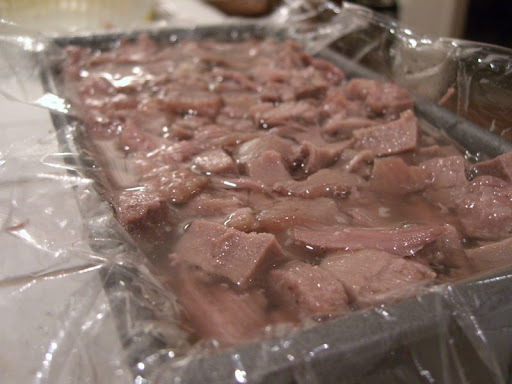 Sherry posted on Chowhound asking for suggestions on how to use the left-over "pork jello", and one of the suggestions was to make Pho'. The flavor profile used in coppa di testa -- with hints of cinnamon, clove and allspice -- ends up being similar to what is used in Pho'. 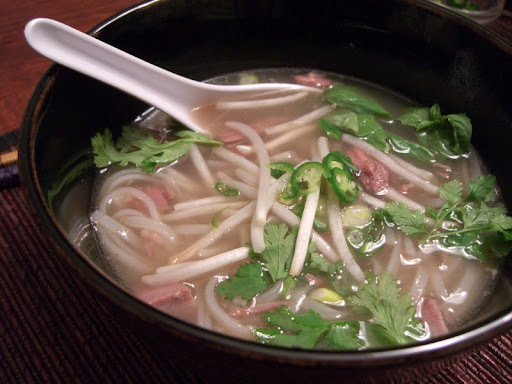 Pho' is usually beef broth based, but we figured what the heck. We cut the pork jello with turkey stock (two parts pork to one part turkey), added rice noodles and traditional condiments, then added a few slices of testa into the mix to provide some "meaty bits". Not authentic, but very tasty. We have been making our own sausage for years now. It is easy to do and allows you to use whatever ingredients you want. We have used pork, turkey, and chicken and have gone all sorts of flavor directions - Mexican, Spanish, Thai. Our go-to staple, though, is the basic Italian sausage. Sausage making starts with the meat. 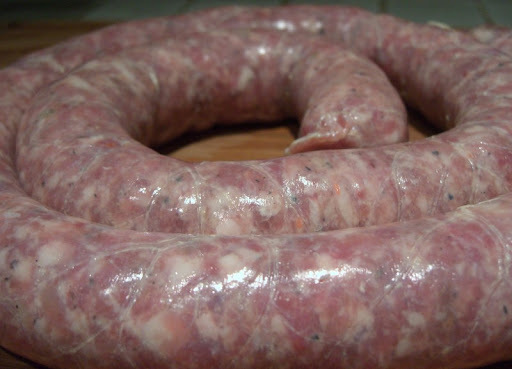 For Italian sausage, you want to use a cut of pork with high fat content. This can usually been done quite cheaply. This time, we used country-style pork ribs for a whopping $0.99 a pound. Next, you will need some kind of meat grinder. We're really happy with the grinding attachment for our Kitchenaid mixer . Once the meat is ground, it needs to be seasoned. Italian sausage is pretty simple. Fennel seed (whole and ground), fresh garlic and hot red chile flakes make up the flavor base. Salt and pepper give it a boost and a little dry white wine helps keep it moist. Using your hands, mix gently, but thoroughly. As Elise and Tom point out, make sure you fry up a little patty to taste for seasoning. Does it need salt? More heat? It is important to chill your seasoned sausage meat in the fridge for at least two hours or overnight. This makes the fat more solid and less slippery to work with when stuffing and improves the final texture. Once you your sausage meat is ready, it is time for casings. 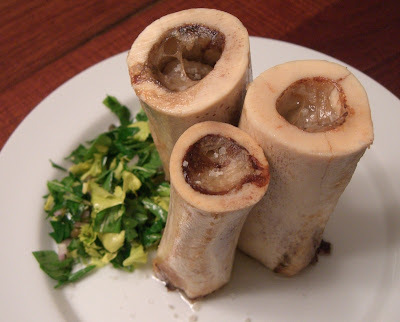 We use natural casings that we get from our local butcher. We use hog casings for regular sized sausage and sheep casings for smaller sausages (like breakfast links). The casing comes packed in salt to preserve it. You'll probably only need 2 or 3 strands - the rest should be sealed tightly and stored in the refrigerator. You need to rinse and hydrate them before use. And then it is back to the Kitchenaid again. This time, the grinder is replaced with a sausage-stuffing tube . Twist up the resulting mega-sausage into smaller ones, and you're done. Smoked Andouille - We got hooked on Andouillle when visiting Louisiana. This is our version. Smoked Beef Sausages - Our recreation of the amazing beef sausages they make in Lockhart, Texas. Two teaspoon chile flakes results in a medium spicy sausage. Adjust up or down to your taste. Cut meat into finger-shaped strips. 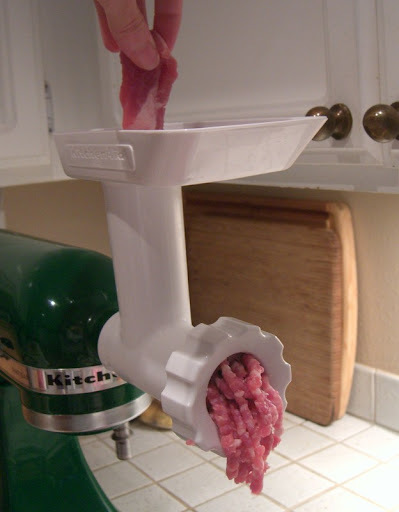 Grind coarsely with a meat grinder. Chill 1 hour. Use your hands to thoroughly mix in the seasonings (use a light hand and work quickly to keep the fat from going mushy). Pinch off about a tablespoon of sausage and cook it in a small fry pan. Taste for seasoning - add additional chile or salt if required. Chill the sausage meat at least 2 hours or overnight. 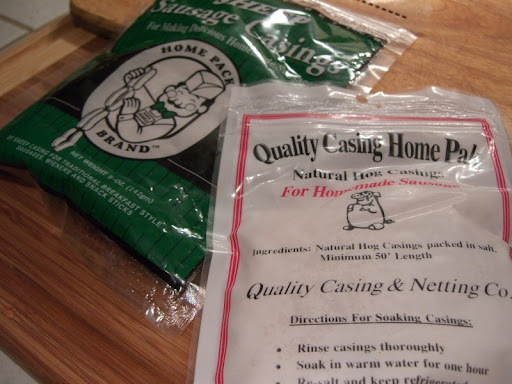 Select 2 or 3 lengths of hog casings and place into a sink full of cool water. Hydrate for about 10 minutes, then scoop up the casings and replace the salty water with fresh water. Rinse the inside of each casing by holding the end open with two fingers and allow a thin stream of cool water to enter the casing and expand it. Empty each casing then repeat the rinse. 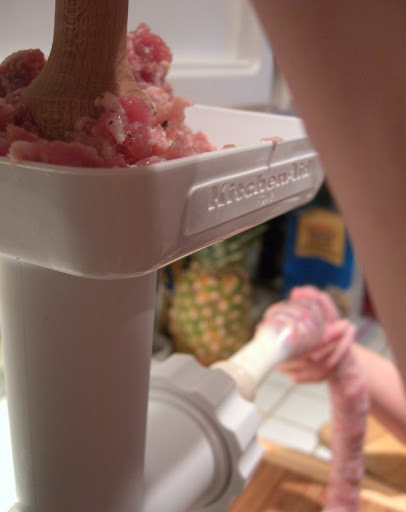 Feed the casing onto a sausage stuffer tube and stuff with cold sausage meat. Pack the sausages fairly full, but don't over-stuff. 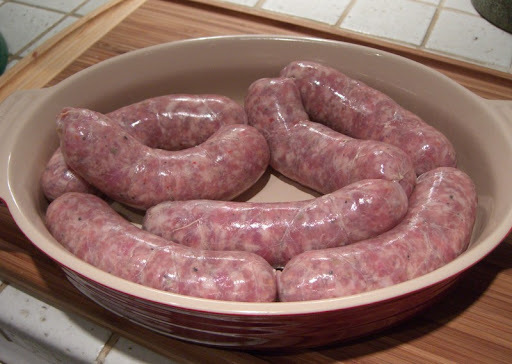 Twist the resulting sausage into links 4 to 5 inches long. Chill a couple hours before cutting apart into individual links. Freeze any sausages that won't be used within a couple of days. Well, the swirling rumors over the past several weeks about the fate of the Liars' club in Mission Beach seem to have settled. The word definitely seems to be that they have packed up for good and moved to Alpine. They might as well have moved to Phoenix - we'd be just about as likely to visit the new location (i.e. not likely). 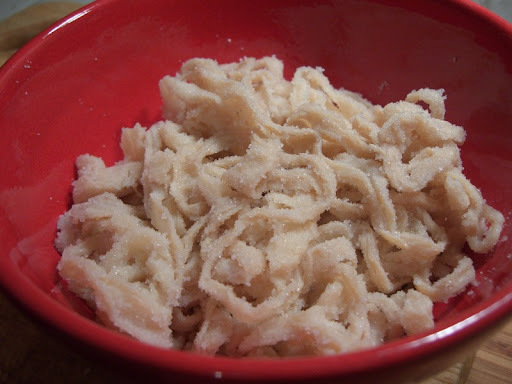 This dish is from the Babbo Cookbook, and is quite easy to make (provided you have testa on hand). 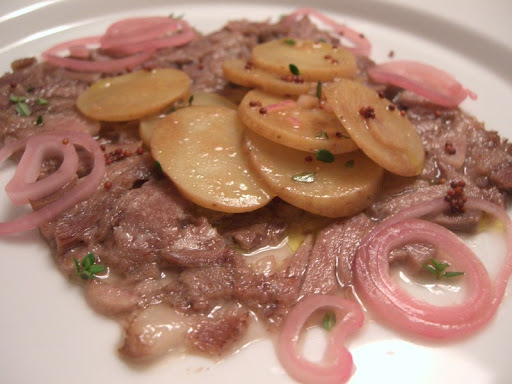 The potatoes give a nice textural contrast, and the "shallot pickles" and mustard seeds provide a complimentary zing. 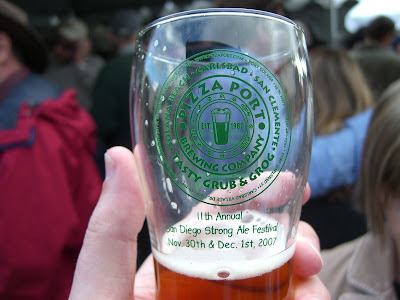 We had a great day yesterday at the 11th Annual San Diego Strong Ale Festival up at Port Carlsbad. 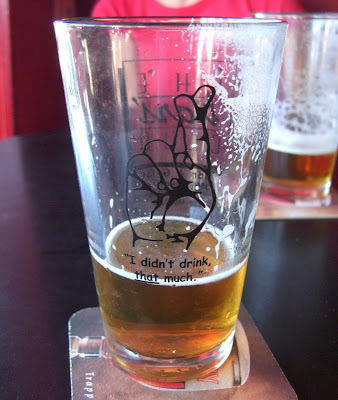 They had a wide variety of Double IPAs, Belgians, and high octane stouts and porters. Without exception, everything I tried was fantastic, but highlights were Alesmith Yulemith and the Oak Aged Yeti Imperial Stout from Great Divide. 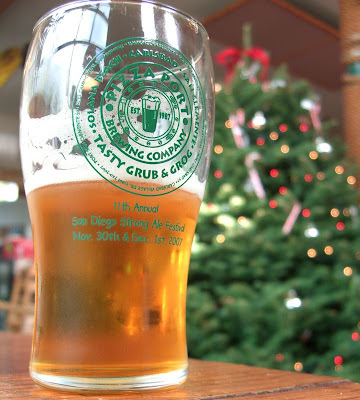 We also stopped in next door at Pizza Port to consume some food and some lower alcohol beverages (Poor Man's and Duet) by the xmas tree. Another busy month here at Menu In Progress. Here is November in review. As always, if you would like the recipe for any of the dishes we didn't blog, just let us know. You can view all of our past monthly review posts here. The dish we made with our goodies from Northgate Market is Coppa di Testa. 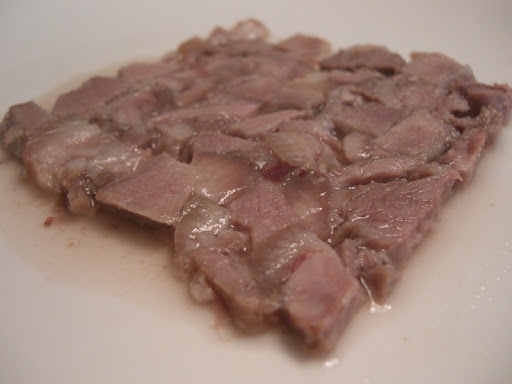 The Italian version of head cheese, testa is truly fantastic stuff. 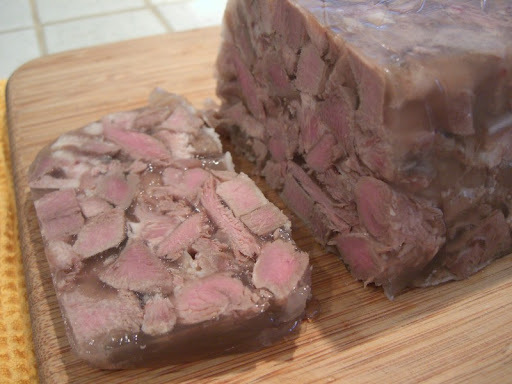 It is a sort of sausage-meets-terrine made of cooked pork pieces and spiced broth set into a firm gelatin mold. Thinly sliced, you can eat it cold with crusty bread or warmed to release the gelatin broth's saucy goodness. If you can obtain the ingredients, it's surprisingly simple to make. 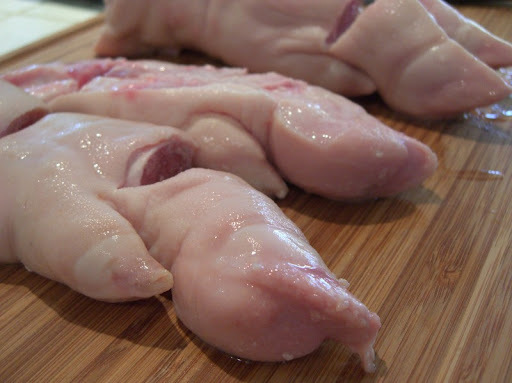 First you need pig's feet (trotters) to contribute sufficient gelatin to the stock. You can use powdered gelatin instead, but using the real thing adds flavor to the mix, in addition to structure. A few pork tongues for extra meatiness (optional, but an easy addition). And of course testa just couldn't be testa (Italian for "head") without a nice pig's head to provide loads of silky pork texture and flavor. If you are brave, you can click on the image below to see the head we used. As you can see (if you peeked), we used a half a pig's head, split down the middle. None of our recipe references commented on the brain, so we were wary and discarded it. Our version of testa is spiced with the sweet and aromatic flavors of cinnamon, cloves, coriander, allspice and nutmeg plus the deep flavored herbs thyme, bay and parsley. 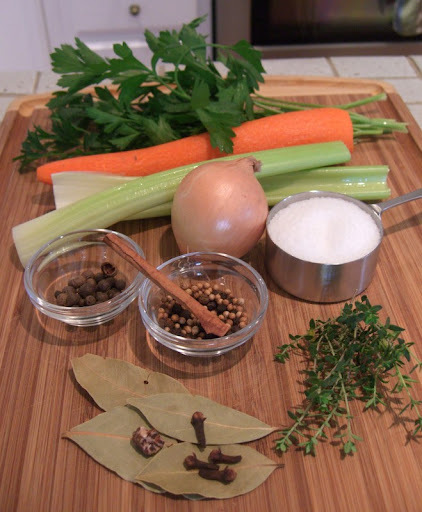 Carrot, celery and onion are all standard additions to almost any stock or stew. Black peppercorns and plenty of salt round out the mix. Everything gets simmered in a very large stockpot until the meats are tender and literally falling off the bone. We found that it's a lot like making a big pot of turkey soup, just slightly different ingredients. Sorting through the cooked meats for the "edible" pieces was a bit of a challenge (since neither of us is very familiar with knuckle, snout or ear) and we may have discarded some true treasures. An Italian grandmother offering a few pointers would've been appreciated. But, after peeling the skin off the tongues and chopping everything into irregular pieces we were rewarded with a brimming bowl of yummy, sticky, bite-sized pork morsels. Before molding the testa, scoop some broth onto a plate and chill it. If there's enough gelatin it should set up quickly and spring back when pressed. We stirred the gel in this photo so it looks a bit soft set, but you can see it's solid toward the left. Finally, the meat goes into a mold with enough spicy gelatin broth to just cover and the whole thing gets chilled overnight. The result - a beautifully marbled slab of porcine goodness. 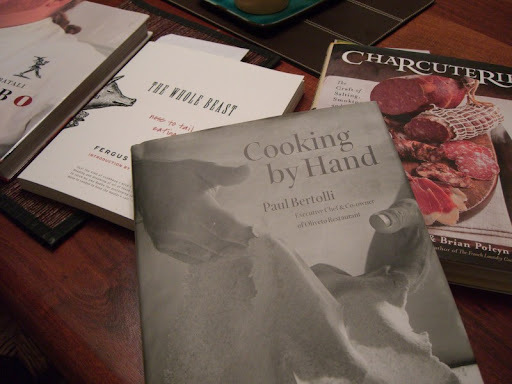 When making the testa, we relied primarily on the recipe from Paul Bertolli's Cooking by Hand , but we also referenced Charcuterie, The Whole Beast and The Babbo Cookbook . I was amused to find that we own *at least four* cookbooks with variations on this dish. Below is the recipe we ended up with. A 16 quart pot is *just* big enough. Use an aggressive amount of salt, especially if you intend to eat this cold since flavors are muted at cooler temperatures. We found it was easier to slice using a serrated bread knife and when set "upright" rather than inverted. Rinse the head, feet (trotters) and tongues under cold water. Remove and discard the brain from the cut side of the head. 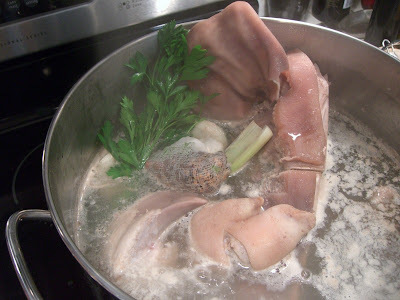 Place the pig parts into a large stockpot and cover with cold water by about 2 inches. 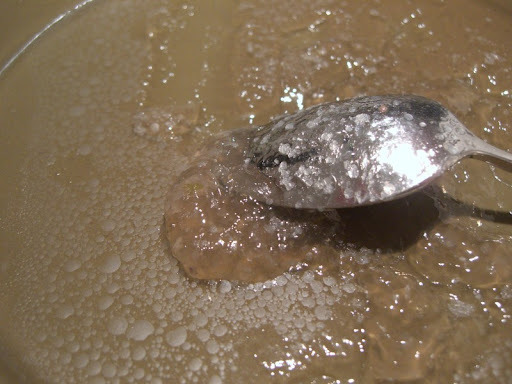 Bring to a boil and skim off the scum that floats to the top. While the pot is heating, place the thyme, bay leaves, peppercorns, cinnamon stick, cloves, allspice, corriander seeds and nutmeg onto a small square of cheesecloth and tie into a loose bundle with kitchen twine. Tie the parsley together with twine to make it easier to remove. Reduce heat to a simmer and add the spice bundle, parsley, celery, carrot, onion and salt to the pot. Cook gently for 2 1/2 to 3 hours or until the meats are very tender. Skim foam from the surface as needed. Using long tongs, remove the tongues after the pot has been simmering for about 1 hour and 15 minutes. When cool enough to handle, peel and cut off the skin with a small knife. 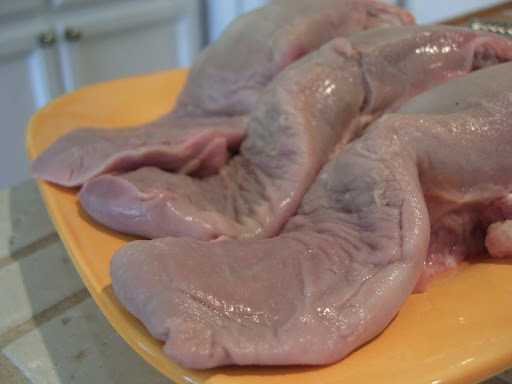 Trim away any grissle and cut the tongue meat into irregular 1/2-inch pieces. 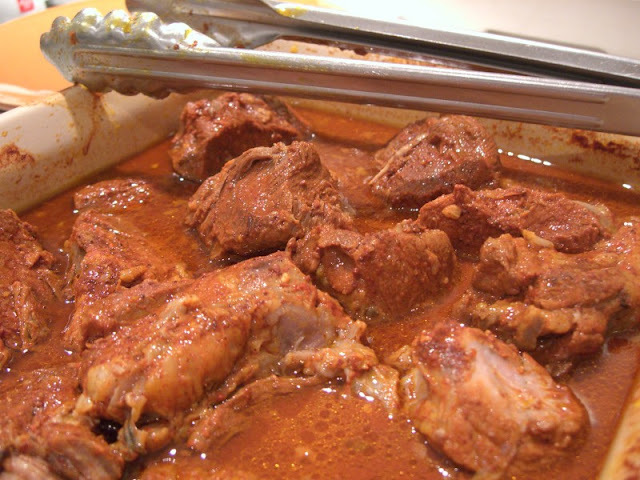 Put into a bowl with a little of the cooking liquid and keep warm in a low oven while the rest of the pork cooks. When the meats are tender, carefully move the head and feet to a large tray to cool. Pick through the trotters and keep any bits of meat found around the knuckles. Remove all the meat from the head, plus some of the snout (not quite meat, not quite fat) and a little of the soft, tender skin pieces. 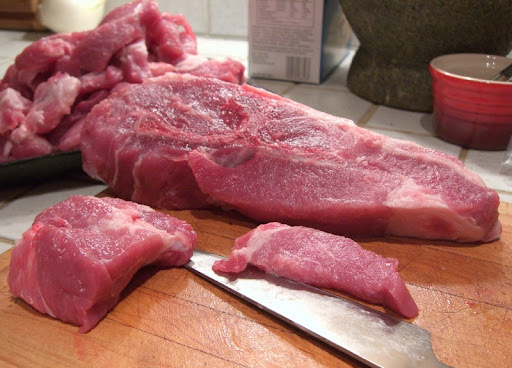 Chop the meat into irregular pieces from about 1/2-inch to an inch each. Cut the snout and skin pieces smaller, about 1/4-inch. Mix the tongue pieces with the head and feet meats. Pour the stock through a fine mesh strainer into another large pot. Scoop a large ladleful of broth onto a plate and chill to check the geletin content. When cooled, maked sure the gel has set up nicely and springs back when pressed. If not, return the stock to the heat and simmer to reduce it somewhat, then check again. 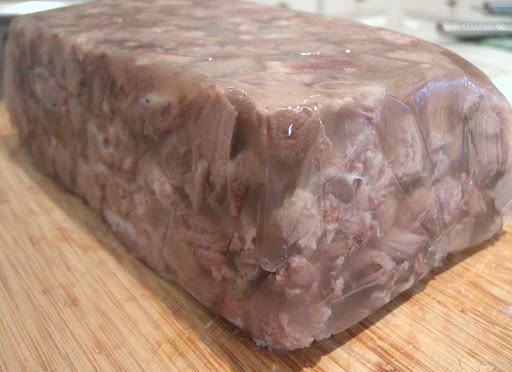 Line a loaf pan or terrine with plastic wrap and fill with the meats. Pour enough cooking liquid into the mold to completely cover, then tap the pan on the counter to try to remove trapped air bubbles. Fold the plastic wrap over the top and chill the testa overnight. To serve, remove from the mold and slice thinly. Eat at room temperature with crusty bread or on a warm plate to soften the gelatin.